Bonjour tout le monde! 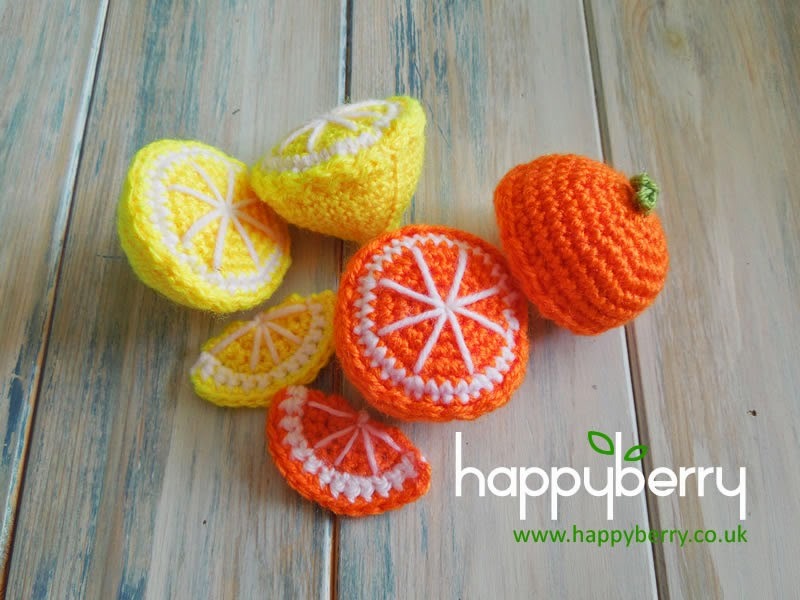 Today I really wanted to share with you the written versions of the last two weeks of Yarn Scrap Friday crochet video tutorials, and that is for oranges and lemons (and limes!). Here we have crochet patterns for the actual fruit shapes but also some fruit segments, they will certainly get your taste buds tingling in anticipation of summer cocktails! Re-join G, Y, or O with ch1, TURN, 1sc in 1st st, 1sc in next 4 sts, 2sc in next st, 1sc in next 5 sts, 2sc in next st, 1sc in last st - (15) Fasten off and tie in all tails. Using W sew from centre hole to outside white edge 5 times going back to the centre each time. Ch1, 1sc in next st and in ea st around, sl st in ch1 to join - (40) Fasten off and tie in all tails. Continuing with O ch1, 1sc in next st and in ea st around, sl st in ch1 to join - (40) Fasten off leaving a long tail for sewing. Using W sew from centre hole to outside white edge 8 times going back to the centre each time, aim to sew towards the white increases and your orange should be divided equally into 8 segments. Use remaining tail end to sew top to base making sure to stuff your orange before you close. For top of one side of your orange you may wish to create a small bit of foliage in green, to do this use G and a 3.5 mm crochet hook and simply *ch3, sl st in 1st ch* repeat from * to * twice more and sew onto top of orange. Continuing with Y or G ch1, 1sc in next st and in ea st around, sl st in ch1 to join - (40) Fasten off leaving a long tail for sewing. Using W sew from centre hole to outside white edge 8 times going back to the centre each time, aim to sew towards the white increases and your lemon should be divided equally into 8 segments. Use remaining tail end to sew top to base making sure to stuff your lemon before you close.